It's a sad fact of life that fewer than one in 10 cars achieve their advertised MPG figures. Thankfully Real MPG lets you see how vehicles really perform. Unlike official laboratory tested fuel consumption figures, Real MPG is based on real life comparative data and allows motorists to see how much on-the-road fuel a vehicle really uses. The X5 is one of BMW's largest SUVs. 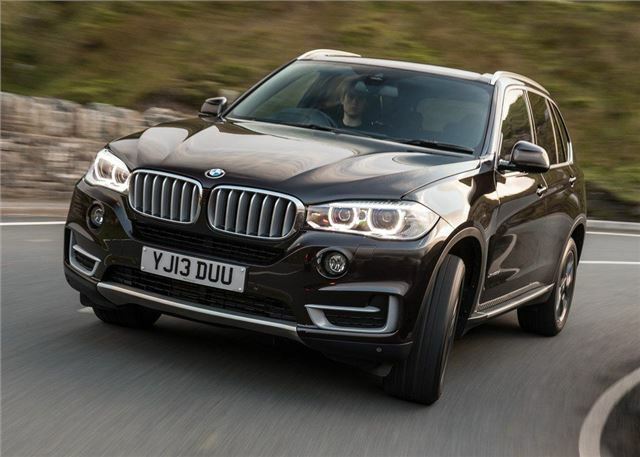 Sadly, it's gargantuan size is matched by its huge running costs, with the X5 scoring a dismal Real MPG average of 66.9 per cent. This means it is one of the worst cars for real world economy on sale right now. All of the diesels miss their advertised fuel targets, with the xDrive 30d having a shortfall of more than 15mpg. The petrols aren't much better either, with similar gaps of 15mpg between the official and Real MPG economy. These comparison figures are slightly disingenuous as they only cover overall consumption of presumably an 'average' driver covering 'average' miles. Buyers of diesel engined vehicles are normally looking for reduced fuel consumption compared with petrol engined ones and there is a likelihood that they cover a greater number of miles, so how is average defined? I for one regularly achieved 39- 41mpg in a 2.2 litre Freelander 2 and have already a seen 51.2mpg in my new 2 litre Discovery Sport. The figures quoted of 35 - 36mpg are in my experience for driving exclusively in an urban environment. This partly emphasises how unrealistic the government required laboratory based figures are. There is an absolute need for a more realistic assessment method. I know this is on the way, but it will still, no doubt, attract criticism. I can achieve remarkably economical fuel consumption on a steady run on open roads devoid of traffic, traffic lights and roundabouts, but manage that on only a handful of occasions each year. When I have to contend with congestion, a proliferation of roundabouts and traffic lights, speed humps and the general stop, start, engine running in a queue (because the queue time has exceeded the allowed engine auto-stop time the battery will allow...! ), then my fuel economy plummets. Maybe government should focus more on maintaining free-flowing traffic than increasing obstructions, controls and delays - then I suspect the nations fuels use would drop at least 20%. My 9 month old Volvo V40 cross country D2 auto is currently averaging 34 mpg, this is driven in eco mode with air con switched off and driving like a saint. Volvo dealer checked it out and said there no faults and it would take 8000 miles before it's 'run in', then it might get better. I was in the motor trade as a technician for many years and haven't heard such rubbish, I don't believe they test cars with 8000 miles on for their official tests. Admittedly most of my journeys are urban, but I can get anywhere near the figures I was told to expect. The fuel consumption of every car I have owned has slowly improved as the mileage has increased. I reckon at least 20,000 miles before the engine reaches it's best. To be absolutely accurate these figures are not "government required", rather they are required by the EU for cars sold in the EU (EU Directive 80/1268/EEC as amended or, for Euro 5 vehicles onwards, Regulation 692/2008). On the same point, I assume that in two years time the current EU directive will be in UK law. On the general point of inaccurate figures, glancing at the 'real time' consumption display on various cars (I realise those figures are not accurate either, but quote for comparative purposes) I would suggest that inclines on roads have far more effect on fuel consumption, even if driving in the most sedate and conservative manner. The more recently built a motorway, the greater the gradient of inclines, the M1 is comparatively 'flat' compared with the M20 or M40, for examples. In my experience ALL Toyotas have a 10per cent speedo/odometer error which disadvantages real consumtion even without predicted fuel value deficiencies. I have owned Avensis, Verso and 2 Yaris as well as a Rio caravanette. Having said that my Yaris Hybrid is now up to an indicated 58mpg with only 2.5k on the clock. But that is still well short of the blurb figures. And pretty much all of that is in traffic or country lanes, i.e. Mixed urban. My 1956 Sunbeam 90 returns an average 26.5 mpg motorway journeys 1.5 miles more than claimed by the makers over 60 years ago and still on its original engine, beat that. The Ford Tourneo Custom is exactly the same...Fix Or Repair Daily advertise just under 44 mpg and even with the best possible driving the most you can expect is 35 mpg or 36 mpg if you're really lucky. So all those advertised figures in my opinion are nothing more than total bull. Even my 13 years old E Class Mercedes 320 CDI automatic estate achieves 43 mpg on regular basis and is far cheaper to maintain than any FORD i have had. Hard to not notice 9 out of 10 are European and German cars over represented. My 2.0 litre petrol auto Honda Accord EX bought new in 2008 averages 40mpg and manages mid 40's on long runs. That's a fair bit better than the official 34mpg.combined. I don't drive it "hard" unless there is a need, but I do drive up to the legal speed limits. It's been a delightful car and I really don't know what I will replace it with when the time comes. Maybe a Mazda 6? It may be worth noting that I insist on using Castrol/Honda 0W-20 oil and premium petrol, Shell when it's available. It makes a difference. I purchased a Fiat 500x 1.4 Multi air 140 bhp last year, fuel consumption was one of the criteria that helped me make my decision, from the off i felt it was using more fuel than my old car ( Alfa Mito 1.4 TB 155 bhp). I carried out a fuel consumption test over a month and found it is doing a combined mpg figure of 35.5 mpg. The published mpg figures are so far out i feel cheated, ok in most ways it is a good car but if i keep it i'am losing money or if i sell it i will lose money. Something needs to be done to help the public make the best choice. Yes, 36mpg is about right for combined and in my case mainly rural/motorway driving. Cheshiredolphin either drives long flat roads at a constant 56mph or works for JLR. I get 19 around town and up to 26 on a long run, I think I am doing well . I have a 2008 DEAT Ibiza Eco. (Diesel) It has done 114,000 miles. I check the oil between services and have never had to add any. I check the fuel consumption about 3 times a year. I am not the world's best driver, nor am I the most economical driver, but I am still getting over 50mpg. My Mercedes C220 Bluetec Sport is brilliant. In 11,000 miles I regularly see over 60 mpg on 20 mile plus journeys in ECO mode and that's driving normally in average traffic with aircon / radio etc in operation. The best figure of 73 mpg was seen on a slow but moving journey halfway around the M25 generally at between 45 and 60 mph. Even when selecting Sport+ mode and driving, eh, enthusiastically, it's difficult to get consumption below 30 mpg. Average consumption over 11,000 miles has been 51 mpg. No, I don't work for Mercedes!!! Peter from Hampshire. I have old Laguna II V6 3.0 2002 estate with 90,000 mls on the clock and am getting 34 mpg on trips without trying at all to be economical,,,just driving normally. Around town it drops to about 22 - 24 mpg depending on air con being used etc but pretty good for biggish petrol motor car. I often look at other peoples fuel economy and wonder how they justify going to a new car with a small engine car that uses just a bit less fuel and to suffer huge depreciation and then continue to worry about the fuel economy. Does it really matter? If you enjoy the car and can afford the fuel relatively easily, just enjoy life. My car is thirsty but the big engine provide effortless driving and fatigue over many hours is non existent. And it has some poke when I feel playful. Go for maximum MPG and you are driving a tiny rattle box, with no go and getting out after 50 miles feeling knackered, along with all the road noise and diesel vibrations. You only live once.